FINAL DAY of 2017's Biggest Mountain House Food Sale! - Save up to 50%! First and biggest MH sale of 2017! 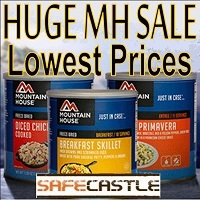 If you're serious about your storage food and preparing for difficult times, then Mountain House is what you stock. And there is no better time than when we are giving you the best discounts around! 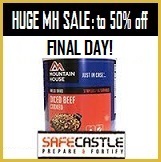 Up to 50% off Mountain House 30-year freeze dried food--delicious, nutritious! 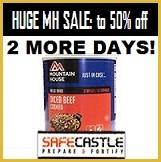 ONLY 2 MORE DAYS: Biggest Mountain House Food Sale of the Year - up to 50% off! NEW: Freeze Dried Cinnamon Butter Pound Cake, Top Round Beef Cubes, Surplus Mac & Cheese! Brand new at Safecastle--some traditional American favorites, but with shelf lives of 25 years! These can be had by the individual #10-size can (the Mac & Cheese also lists by the 6-can case). 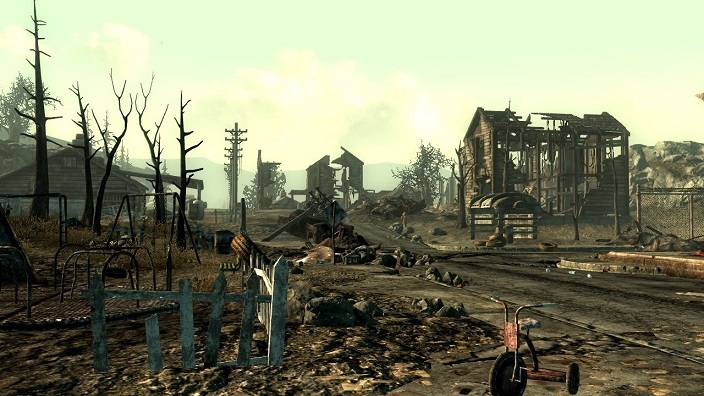 Prepped and Ready for the Global Trainwreck? What is it all leading up to? Admittedly my crystal ball is a bit cloudy, but it sure looks to me like a global chain-reaction train wreck is about to befall us. 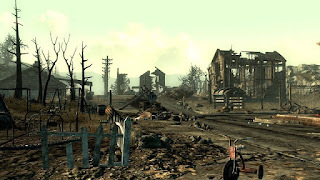 As a timely heads-up, there are a lot of other smart folks out there right now who are also anticipating it and getting very busy with serious final-phase prepping. We can certainly help (like nobody else) if you too are getting restless watching the news reports. All Folding Bikes and E-Bikes are Stealth-Discounted! Montague folding bikes are the gold standard in rugged yet fun folding bikes ... developed by DARPA for military paratroopers and the number one pick by adventurers and preppers around the globe. ProdecoTech electric bikes are renowned, powerful two-wheelers for all who need serious power-assisted options ... and wow, talk about letting the good times roll! Some of these e-bikes even offer folding options! Shop Now: Feel the Wind in your Hair!